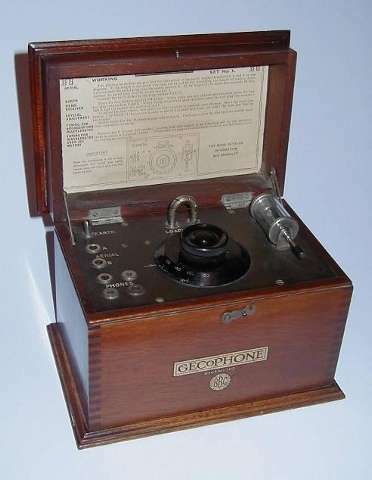 This is the GECoPHONE Crystal Detector Set No. 1. Built by GEC (UK) in 1923, this simple crystal set is housed in a polished mahogany case with lift up lid and ebonite control panel. It bears the 'BBC' stamp and P.O. Reg. No. 102. Connection points for the aerial, earth and headphones are provided, and the controls comprise a tuning knob and a lever to adjust the detector. The set would have cost £5 10s in 1923, of which 7s 6d (6.8%) was a royalty paid to the BBC. Having no valves in the circuit gave a considerable price advantage. In 1923 the Marconi company received a royalty of 12s 6d for each valve used in a set. The galena crystal is held in the screw-cup to the right and the cat's whisker (a curly piece of wire) is held in a sort of pin-chuck to the left. In operation, the handle attached to the cat's whisker is carefully slid in and out and/or rotated so that the cat's whisker drags across the surface of the crystal. The crystal is covered in many contact sites that will allow rectification to take place. With careful adjustment the cat's whisker will fall upon one of these sites and when this happens a detector is formed. Follow this link for more information on Crystal Sets. The audio output from the detector is connected to the headphones via terminals 1 & 2. Two sets of headphones can be connected in series by connecting one set to terminals 1 & 3 and the other set to terminals 2 & 4. The capacitor connected across terminals 1 & 2 is included to dump residual RF current to earth. For reception of the 15kW 5XX station on 1600 metres (broadcast from the Marconi works in Chelmsford, England) the 1600m Loading Coil could be plugged in. Coupling capacitors in this set are of the old GECoPHONE 'wire-wound' type. These were quite unusual and were made as follows: A metal rod was wrapped with a thin layer of mica and over this was wound a coil of tinned copper wire, the turns of which were shorted with solder to make them non-inductive. One connection was made to the metal rod and the other to the winding layer. 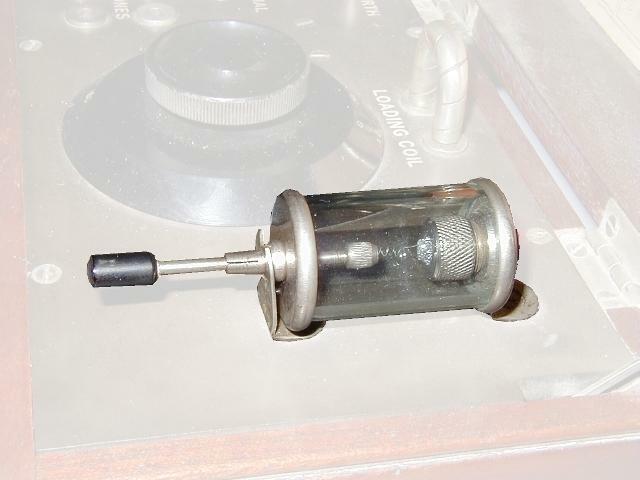 These capacitors were used extensively in early GECoPHONE sets.